Thank you to everyone who completed our questionnaire. We are delighted with the positive feedback and comments. 98.1% my children are safe, well looked after and happy. Only one parent gave a negative response to this statement. Very happy with teaching and school. I find this school very supportive. They go above and beyond for their pupils. I am very happy with the school and feel very lucky that my daughter got a place. Very happy with the progress my child makes. Mrs Spencer has been very supportive. This school is fantastic at recognizing every individual child’s talents and abilities and rewarding this accordingly. Very pleased! We are really pleased with this school and the progress made in a short space of time. Very happy at how well my child has settled in. Not sure about E books. Not sure what appropriate homework is. Not sure homework is challenging enough. Homework load a little too much. Joined up writing before a child can spell is a little too much. More communication needed for new parents (Maple class) on homework requirements, tapestry usage and general expectations from the start of term. 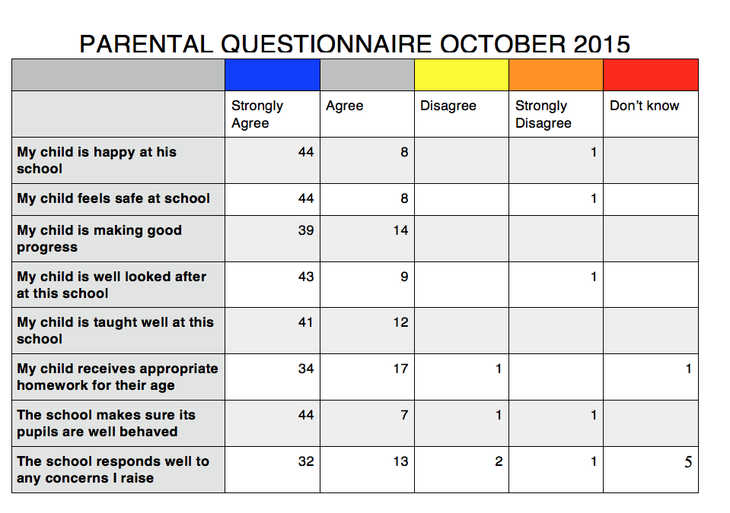 One parent who strongly disagreed felt that there were issues with bullying. Strongly disagree answers were from a teenager and not a parent.